Heat transfer is the exchange of thermal energy between physical systems. The rate of heat transfer is dependent on the temperatures of the systems and the properties of the intervening medium through which the heat is transferred. The three fundamental modes of heat transfer are conduction, convection and radiation. Heat transfer, the flow of energy in the form of heat, is a process by which a system's internal energy is changed, hence is of vital use in applications of the First Law of Thermodynamics. Conduction is also known as diffusion, not to be confused with diffusion related to the mixing of constituents of a fluid. The direction of heat transfer is from a region of high temperature to another region of lower temperature, and is governed by the Second Law of Thermodynamics. Heat transfer changes the internal energy of the systems from which and to which the energy is transferred. Heat transfer will occur in a direction that increases the entropy of the collection of systems. Heat transfer ceases when thermal equilibrium is reached, at which point all involved bodies and the surroundings reach the same temperature. Thermal expansion is the tendency of matter to change in volume in response to a change in temperature. Heat transfer is a. process function (or path function), as opposed to functions of state; therefore, the amount of heat transferred in a thermodynamic process that changes the state of a system depends on how that process occurs, not only the net difference between the initial and final states of the process. 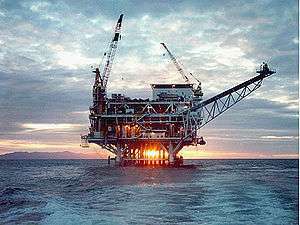 The transfer of energy between an object and its environment, due to fluid motion. The average temperature, is a reference for evaluating properties related to convective heat transfer. where Q is heat flux (W/m²), ρ is density (kg/m³), is heat capacity at constant pressure (J/kg·K), ΔT is the change in temperature (K), is velocity (m/s). On a microscopic scale, heat conduction occurs as hot, rapidly moving or vibrating atoms and molecules interact with neighboring atoms and molecules, transferring some of their energy (heat) to these neighboring particles. In other words, heat is transferred by conduction when adjacent atoms vibrate against one another, or as electrons move from one atom to another. Conduction is the most significant means of heat transfer within a solid or between solid objects in thermal contact. Fluids—especially gases—are less conductive. 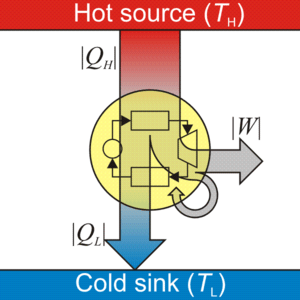 Thermal contact conductance is the study of heat conduction between solid bodies in contact. 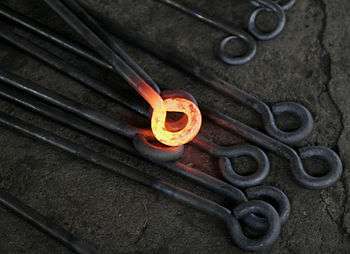 The process of heat transfer from one place to another place without the movement of particles is called conduction Example:Heat transfer through Metal rods. Steady state conduction (see Fourier's law) is a form of conduction that happens when the temperature difference driving the conduction is constant, so that after an equilibration time, the spatial distribution of temperatures in the conducting object does not change any further. In steady state conduction, the amount of heat entering a section is equal to amount of heat coming out. 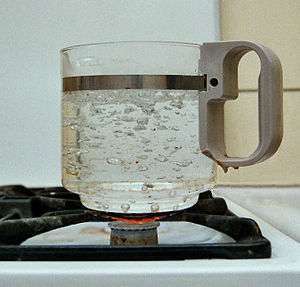 The flow of fluid may be forced by external processes, or sometimes (in gravitational fields) by buoyancy forces caused when thermal energy expands the fluid (for example in a fire plume), thus influencing its own transfer. The latter process is often called "natural convection". All convective processes also move heat partly by diffusion, as well. Another form of convection is forced convection. In this case the fluid is forced to flow by use of a pump, fan or other mechanical means. The Rayleigh number ( ) is a measure determining the relative strength of conduction and convection. Thermal radiation occurs through a vacuum or any transparent medium (solid or fluid). It is the transfer of energy by means of photons in electromagnetic waves governed by the same laws. 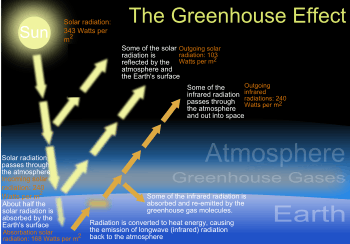 Earth's radiation balance depends on the incoming and the outgoing thermal radiation, Earth's energy budget. Anthropogenic perturbations in the climate system are responsible for a positive radiative forcing which reduces the net longwave radiation loss to space. where Q is the heat flux, ε is the emissivity (unity for a black body), σ is the Stefan-Boltzmann constant, and T is the absolute temperature (in Kelvin or Rankine). Radiation is typically only important for very hot objects, or for objects with a large temperature difference. 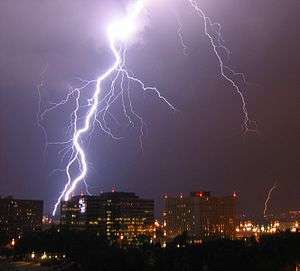 Lightning is a highly visible form of energy transfer and is an example of plasma present at Earth's surface. Typically, lightning discharges 30,000 amperes at up to 100 million volts, and emits light, radio waves, X-rays and even gamma rays. Plasma temperatures in lightning can approach 28,000 Kelvin (27,726.85 °C) (49,940.33 °F) and electron densities may exceed 1024 m−3. Solid - Deposition, freezing and solid to solid transformation. Gas - Boiling / evaporation, recombination / deionization, and sublimation. Liquid - Condensation and melting / fusion. Melting is a physical process that results in the phase transition of a substance from a solid to a liquid. The internal energy of a substance is increased, typically by the application of heat or pressure, resulting in a rise of its temperature to the melting point, at which the ordering of ionic or molecular entities in the solid breaks down to a less ordered state and the solid liquefies. 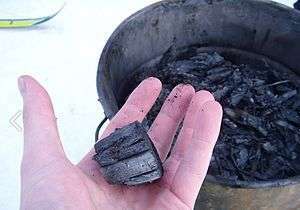 An object that has melted completely is molten. Substances in the molten state generally have reduced viscosity with elevated temperature; an exception to this maxim is the element sulfur, whose viscosity increases to a point due to polymerization and then decreases with higher temperatures in its molten state. The effectiveness of a radiant barrier is indicated by its reflectivity, which is the fraction of radiation reflected. A material with a high reflectivity (at a given wavelength) has a low emissivity (at that same wavelength), and vice versa. At any specific wavelength, reflectivity = 1 - emissivity. An ideal radiant barrier would have a reflectivity of 1, and would therefore reflect 100 percent of incoming radiation. Vacuum flasks, or Dewars, are silvered to approach this ideal. In the vacuum of space, satellites use multi-layer insulation, which consists of many layers of aluminized (shiny) Mylar to greatly reduce radiation heat transfer and control satellite temperature. Heat engine is a system that performs the conversion of heat or thermal energy to mechanical energy which can then be used to do mechanical work. Thermocouple is a temperature-measuring device and widely used type of temperature sensor for measurement and control, and can also be used to convert heat into electric power. 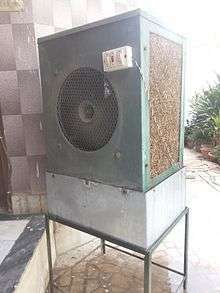 Thermoelectric cooler is a solid state electronic device that pumps (transfers) heat from one side of the device to the other when electric current is passed through it. It is based on the Peltier effect. Thermal diode or thermal rectifier is a device that causes heat to flow preferentially in one direction. Thermal transmittance is the rate of transfer of heat through a structure divided by the difference in temperature across the structure. It is expressed in watts per square meter per kelvin, or W/m²K. Well-insulated parts of a building have a low thermal transmittance, whereas poorly-insulated parts of a building have a high thermal transmittance. In Quantum Physics laser cooling is used to achieve temperatures of near absolute zero (−273.15 °C, −459.67 °F) of atomic and molecular samples, to observe unique quantum effects that can only occur at this heat level. Thermal energy storage refers to technologies used to collect and store energy for later use. They can be employed to balance energy demand between day and nighttime. The thermal reservoir may be maintained at a temperature above (hotter) or below (colder) than that of the ambient environment. Applications include later use in space heating, domestic or process hot water, or to generate electricity. ↑ New Jersey Institute of Technology, Chemical Engineering Dept. "B.S. Chemical Engineering". NJIT. Retrieved 9 April 2011. ↑ Lienhard, John H.,V; Lienhard, John H., V (2008). A Heat Transfer Textbook (3rd ed.). Cambridge, Massachusetts: Phlogiston Press. ISBN 978-0-9713835-3-1. OCLC 230956959. ↑ Welty, James R.; Wicks, Charles E.; Wilson, Robert Elliott (1976). Fundamentals of momentum, heat, and mass transfer (2 ed.). New York: Wiley. ISBN 978-0-471-93354-0. OCLC 2213384. ↑ Taylor, R.A. (2012). "Socioeconomic impacts of heat transfer research". International Communications in Heat and Mass Transfer. 39 (10): 1467–1473. doi:10.1016/j.icheatmasstransfer.2012.09.007. ↑ "Thermal-FluidsPedia | Mass transfer"
1 2 3 Abbott, J.M. Smith, H.C. Van Ness, M.M. (2005). Introduction to chemical engineering thermodynamics (7th ed.). Boston ; Montreal: McGraw-Hill. ISBN 0-07-310445-0. 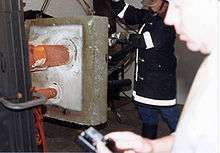 ↑ "Thermal-FluidsPedia | Heat conduction". ↑ Çengel, Yunus (2003). Heat Transfer: a practical approach. McGraw-Hill series in mechanical engineering. (2nd ed.). Boston: McGraw-Hill. ISBN 978-0-07-245893-0. OCLC 300472921. Retrieved 2009-04-20. ↑ "Thermal-FluidsPedia | Convective heat transfer"
↑ "Convection — Heat Transfer". Engineers Edge. Engineers Edge. Retrieved 2009-04-20. ↑ Geankoplis, Christie John (2003). Transport processes and separation process principles : (includes unit operations) (4th ed.). Upper Saddle River, NJ: Prentice Hall Professional Technical Reference. ISBN 0-13-101367-X. ↑ Wendl, MC (2012). Theoretical Foundations of Conduction and Convection Heat Transfer. Wendl Foundation. ↑ Hartman,Carl and Bibb, Lewis. "The Human body and its enemies: a textbook of physiology hygiene and sanitation", World Book Co., 1913, p.232. 1 2 Cengel, Yunus A. and Ghajar, Afshin J. "Heat and Mass Transfer: Fundamentals and Applications." , McGraw-Hill, 4th Edition, 2010. ↑ Wilmore, Jack H.; Costill, David L.; Kenney, Larry. "Physiology of sport and exercise". Human Kinetics. 2008: 256.